Avista Corp (NYSE: AVA) currently pays a dividend yield of 2.9% which is below the Utilities sector median of 3.4%. While this makes the total return potential for Avista look uninviting, investors may change their mind when analyzing the company’s future dividends. In this article, I calculate Avista’s fair value by forecasting its dividend distributions and discounting them back to today’s value. The Dividend Discount Model (DDM) estimates the value of a company's stock price based on the theory that its worth is equal to the sum of the present value of its future dividend payments to shareholders. But how do we know if it's appropriate to use a dividend discount analysis when estimating the fair value of Avista? Many analysts find it difficult when trying to figure out the correct valuation methodology for a given company or are biased towards one specific approach. This is often a mistake which can negatively impact investment decisions and result in trading losses or missed opportunities. No two companies are the same and every business consists of unique characteristics that may require you to adjust your analysis. Understanding leverage trends is the first step when determining what valuation analyses are relevant for a given company. When a company's leverage doesn’t fluctuate or is expected to remain stable over time, then an equity valuation model (e.g. equity DCF, DDM) will be the most appropriate valuation technique. The reason for this is because when leverage is stable, interest expense on debt can typically be projected with much more reliability. How do we check if a company's leverage has been fluctuating or is expected to do so? This isn't always straightforward but checking recent debt ratio trends can be a good indicator. Avista's debt to equity ratio has been relatively stable over last few years ranging from 111.3% to 113.2%. This suggests that an equity valuation model is a suitable technique when valuing the company's shares. Now does it make sense to use a dividend discount model knowing that an equity valuation technique is an appropriate methodology? The next step is to figure out if Avista pays a dividend and if so, is its payout ratio relatively high (typically above 75%)? The table below highlights this information. Avista distributed a total of $92 million in cash dividends to shareholders in its most recent fiscal year Dec-17 which represented a payout ratio of 79.8%. It appears that the company meets both criteria. Therefore, it is fitting to use a dividend discount model when determining the fair value of Avista stock. The first step in building a dividend discount model is to forecast net income since forecasting dividends directly can be difficult. So let's create a net income forecast for the next five years and use that as the basis for projecting future dividends. As of April 5, Wall Street analysts are projecting a mediocre growth rate in the company's bottom-line over the next five years. Net income is expected to reach $179 million by fiscal year 2022. I use the net income projections above to serve as the basis for my dividend forecast. The next step is to forecast the payout ratio where I selected 66.0% for the next fiscal year which is in line with historical levels. The last step is to select a discount rate to calculate the present value of the forecasted dividends. I used finbox.io’s Weighted Average Cost of Capital (WACC) model to help arrive at an estimate for the company's cost of equity. I determined a reasonable discount rate for Avista to be 9.6% at the midpoint. 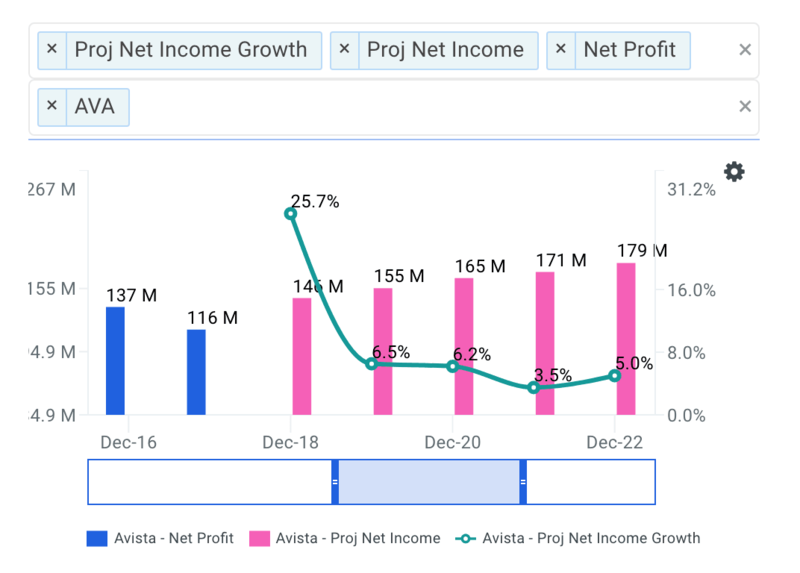 An updated cost of capital analysis using real-time data can be found at finbox.io's Avista WACC model page. 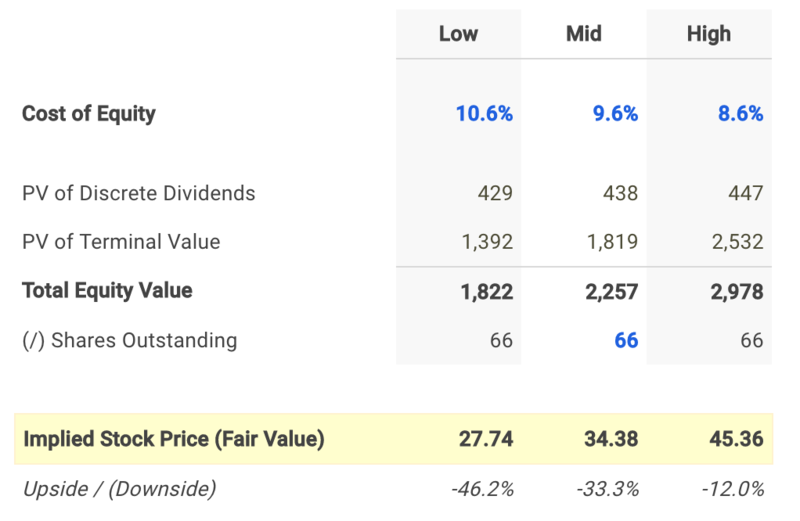 The assumptions used in the dividend discount model calculate a fair value per share for Avista of $34.38, -33.3% below its current stock price of $51.55. Therefore, AVA appears to be an overvalued stock and not necessarily a good entry point opportunity. However, it's important to understand that a dividend discount model will inherently undervalue a stock. This is typically the result of the payout ratio assumption being less than 100% implying some cash leakage. Meaning the approach does not capture value that would otherwise build up as cash on the balance sheet. In practice, this excess retained cash is usually paid out to shareholders as special dividends or to make up for cash shortfalls for future dividends during economic downturns. This helps explain, at least partially, why Avista looks like an overvalued stock based on this approach. Nevertheless, a dividend discount analysis is still a helpful tool in combination with the understanding that it calculates a conservative intrinsic value estimate. Meaning an extremely attractive opportunity would be a stock where (1) a dividend discount model is appropriate and (2) shares looks undervalued based on its future dividends. Note that there are a number of fundamental factors I have not considered in this analysis. I recommend that you continue your research on Avista to gain a better understanding of its future prospects.